Viral Puzzle – Which glass gets full first? 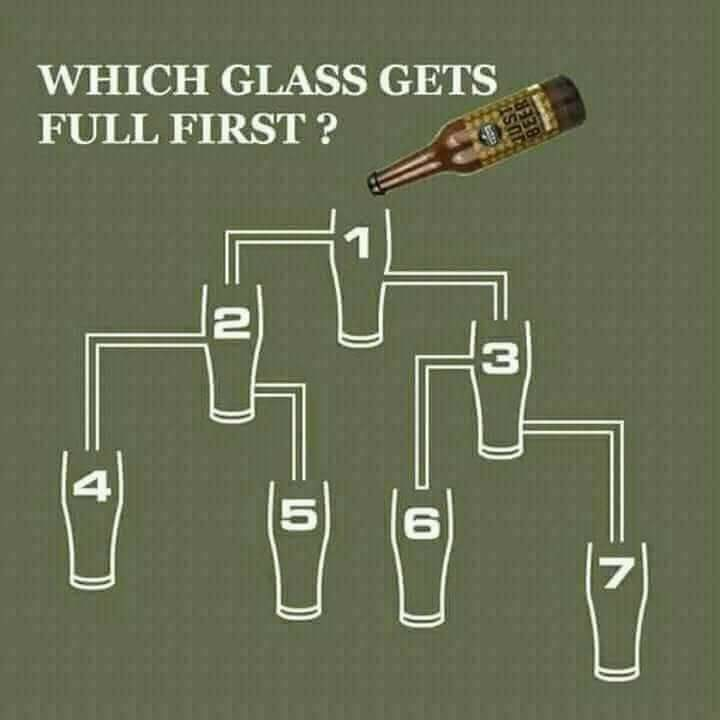 Kumar April 8, 2018 June 18, 2018 2 Comments on Viral Puzzle – Which glass gets full first? Can you answer this viral puzzle? Which glass would get filled with beer first? Just concentrate and look for the beer flowing through connected glass. I am sure you would be able to answer this puzzle. I have tried to solve this and answer is published at the end of page. If you cannot solve it then check the answer. If you think answer should be something else, then use comment section to let us know your answer. Also Try: Can you find Panda in this pic? You can match you answer by clicking link to show answer. Please Share it with others if you find it interesting. Also, follow our Facebook page for more riddles and puzzles. Answer is Glass 3 will get filled first.